Malidoma Patrice Somé was born in Upper Volta (now Burkina Faso), West Africa. Initiated in the ancestral traditions of his tribe, he is a medicine man and diviner. He holds three master’s degrees, as well as Ph.D.s from the Sorbonne and Brandeis. Somé’s mission to form a spiritual connection between African and Western spiritual traditions began after he was kidnapped from his tribe at the age of four, only to escape and return to his tribe when he was twenty to learn its language and spiritual traditions. The experience shaped his approach to intercultural dialogue, especially in his effort to respond to such events with reconciliation rather than increased hostility. A popular speaker at men’s movement meetings across the country, he discusses tribal customs and daily life, spiritual beliefs, the world of the ancestors, and the life-giving process of initiation. For the elders in his village, Malidoma’s life in the West was preordained. As Malidoma relates in his recent book “Of Water and the Spirit,” he was taken from his tribe at the age of 4 by Jesuit missionaries, who intended to make him a priest. At 20, he rebelled and went back to his village. But he could not speak his native tongue, was hardly recognized by his family, and was regarded with considerable suspicion by the villagers. After much discussion by village elders and undergoing his tribal initiation, Malidoma, whose name means “be friends with the stranger/enemy,” was told that he would fulfill his destiny by living his life in the West as a teacher of African ways and wisdom. 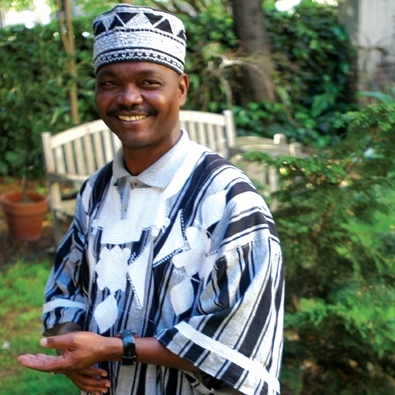 “The village will be reborn,” the elders predicted, “in the heart and soul of the culture that is destroying the village.” Under their spiritual guidance, Malidoma pursued a Western education, first at the politically volatile university in Ouagadougou, Burkina Faso’s capital, then at the Sorbonne in France and at Brandeis University in Massachusetts. He holds doctorates in both political science and literature. Malidoma now lives in Oakland, Calif. In his workshops, he teaches that it is unthinkable to separate daily life from ritual contact with the unseen world of spirit, or to pursue political change without ongoing spiritual development. Africa’s inherent wisdom of marrying daily life to a spiritual worldview, Malidoma suggests, may prove key to healing our own cultural catastrophes.